Working in a medium that combines color, texture and design is the dream of many artists. 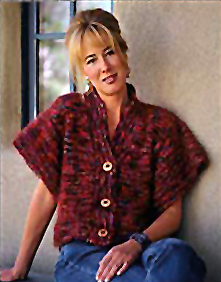 As a designer and knitter, Debbie Miller D’Errico does precisely that, creating unique pieces of wearable art ranging from the softest wools and silks to fancies and wonderfully textured cottons and wools. 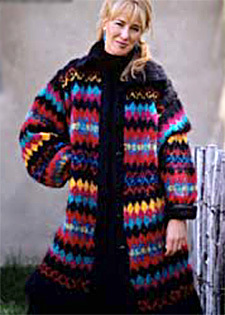 Many of the yarns are hand spun and hand dyed or custom made especially for her in both this country and Europe. The buttons, which are equally unique, are frequently hand made from glass, ceramic, abalone and other unusual materials. 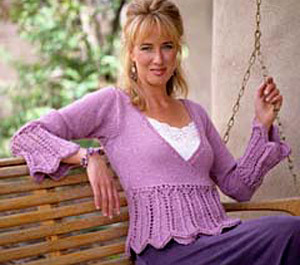 Inspired by the color and texture of each skein of yarn, D’Errico envisions what the finished garment will be like, and sometimes, it works out precisely as expected. At other times, the artistry that comes from her knitting needles seems to have a mind of its own and becomes something both quite unexpected and more exquisite than originally imagined!